I read this article and found it very interesting, thought it might be something for you. The article is called Gerber 'Good Start' gentle powder infant formula recalled and is located at http://www.imperfectparent.com/topics/2012/03/12/gerber-good-start-gentle-powder-infant-formula-recalled/. The powder version of the popular Gerber ‘Good Start’ Gentle infant formula has been recalled due to gastrointestinal problems and complaints of a foul odor. Remaining cans of the recalled batch are being pulled from retailers shelves today. Gerber foods is offering consumers a replacement can of formula by calling the Gerber Parents Resource Center at 800-487-7763 or by submitting this form. According to a Gerber press release, the product doesn’t pose an immediate health risk but may cause an upset stomach. 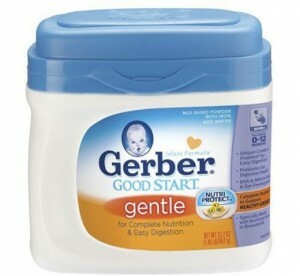 Gerber also states that the problem is limited to Good Start Gentle formula only at this time and is not affected by other Gerber products or formulas. The recall has been in effect since March 8, 2011. The foul odor source or reason has not yet been identified.